The largest study of its kind with more than 17,000 participants. Over 14 years ago Kaiser Permanente and the Centers for Disease Control conducted The ACE Study , the largest study of its kind with more than 17,000 participants. The purpose of the study was to see how stressful and traumatic childhood experiences influence later physical and emotional health. The study observed 10 types of adverse childhood experiences: emotional, physical, and sexual abuse, emotional neglect, physical neglect, domestic violence against the mother, mental illness of a family member, substance abuse in the home, parental separation or divorce, imprisonment of a household member. The scoring system of the ACE study is simple: exposure to any of the 10 categories of adverse childhood experiences was scored as one point. Multiple exposures within a category were not scored. Therefore, the ACE score can range from 0 to 10. Only 36% of those surveyed had an ACE score of 0, and 22% had a score of 3 or greater. 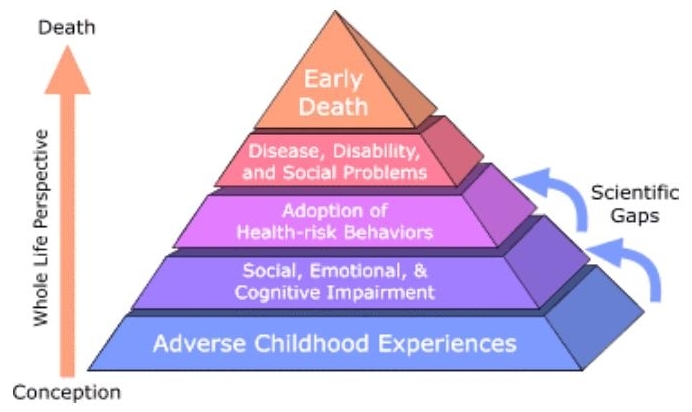 The impact of adverse childhood experiences (ACEs) are significant and long-lasting. As your ACE score increases, the risk for the following health problems increases in a strong and graded fashion: alcoholism and alcohol abuse, COPD (chronic obstructive pulmonary disease), depression, ischemic heart disease (IHD), liver disease, fetal death, illicit drug use, smoking, attempted suicide, unintended pregnancy, sexually transmitted diseases, partner violence, obesity. When a child is exposed to abuse, neglect, or household dysfunction they are prone to experience social, emotional, or cognitive impairment. They respond by choosing risky behaviors (drugs, smoking, alcohol) which results in disease, disability, or social problems, which often results in an early death. Adverse Childhood Experiences (ACEs) affect over 60% of people, resulting in social, mental, physical, and spiritual damage. At the center of self-destructive behavior (illicit drug use, sexual activity, smoking, alcohol abuse, and overeating) is a maladaptive response to the stress caused by adverse childhood experiences. The physical effects are well documented and wide ranging: chronic obstructive pulmonary disease, ischemic heart disease, chronic lung disease, liver disease, impaired brain development, diabetes, obesity, and more. Emotional effects of ACEs can result in poor self-image, nervousness, anxiety, anger, self-pity, depression, attempted suicide, psychosomatic disorders and more. The effects of adverse childhood experiences (ACEs) do not just go away. “The ACE Study reveals a powerful relationship between our emotional experiences as children and our physical and mental health as adults”, “It documents the conversion of traumatic emotional experiences in childhood into organic disease later in life”, “One does not ‘just get over’ some things, not even fifty years later” (Felitti, 2002). The impact of The ACE Study has been monumental- impacting the child protective services programs of nearly every state. Similar studies are being conducted in many nations. The ACE Pyramid- Felitti VJ, Anda RF, Nordenberg D, Williamson DF, Spitz AM, Edwards V, Koss MP, Marks JS. The relationship of adult health status to childhood abuse and household dysfunction. American Journal of Preventive Medicine. 1998;14:245-258. * Felitti V.,J., Anda RF, Nordenberg D, Williamson DF, Spitz AM, Edwards V, Koss MP, Marks JS. The relationship of adult health status to childhood abuse and household dysfunction. American Journal of Preventive Medicine. 1998;14:245-258. Felitti, V., J. (2003). Origins of addiction: Evidence from the Adverse Childhood Experiences Study. Felitti, V., J. (2002). The relationship of adverse childhood experiences to adult health: Turning gold into lead.